Last week, I invited people to share their Valentine’s Day experiences for the Be Kind section. It was nice to hear from some of you. One of the takers was close to home. Melissa from our office was touched by her honey when he dedicated a music set on KXCI to her. They are going on a quarter century together as an ‘item’. The songs included ‘Dedicated to the One I Love’, ‘She’s an Angel’ and a couple of others. Good for Seth, for collecting some brownie points. They all add up. Mark’s goal was seafood. Through the magic of the internet, he found Blessing – a local wholesaler who took the time to service a single dinner order. The owner helped with the selection and with preparation suggestions. He made Mark a hero, for at least one meal. Blessing is located at 1045 S. Highland. I can’t speak for the proprietor, but if he helped one struggling husband out of a jam, he probably has the heart to do other non-wholesale customers as well. Give them a call at 320-1253. 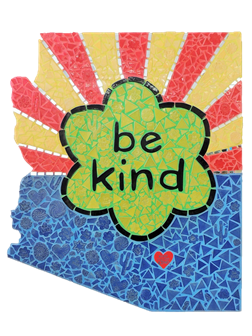 This one is truly in the spirit of what Be Kind items are supposed to be, which are not world saving outpourings, but the simple one-off extensions of love that make us a great community. My mother-in-law puts on miles and miles on her walker, mostly in the Blenman-Elm area. Last week a man out in the cold doing road repair went over and secured a flower to the handle of her walker. No agenda – nothing expected in return. I would love to fill this section with that sort of thing every week. Send me examples. Peter Drucker authors books on business relations. He once wrote ‘The most important thing in communication is hearing what isn’t said.’ I think that is what’s behind the giving heart in these Be Kind examples. This is a shot (taken with my flip phone) of the room we have at the Ward 6 office where donations for the migrants/refugees/asylum seekers are stored until we run them over to the monastery. As you can see, Tucson continues to step up in support of this very vulnerable population. Last Wednesday, ICE dropped off more than one hundred new guests. As I was walking over to the Ward office on Friday evening, I saw a Homeland Security bus pulling away – the size of a greyhound bus – having just delivered dozens more people. On Wednesday last week, the Mayor and Council, in full, joined Richard, Regina, and me in supporting the Nogales Mayor and Council calling for the removal of the razor wire that is on the border fence in Nogales. Ahead of that vote, I shared a little about the nature of the families we are seeing at the monastery. It is worth repeating a portion of here. The majority of the people we are seeing are Guatemalans. Not all of them are, but the majority. All have made the journey from their home to escape violence, corruption, and living standards that challenge survival. It speaks volumes to know that travelling with traffickers, and feeling that is a safer option than the alternative, is often how they make the trip. They arrive at the border tired, often dehydrated and hungry, and sometimes ill. It is not uncommon that they have been robbed, beaten, and worse. ICE processes them and delivers them to the monastery with the requirement that each family member appear before a judge within 15 days of their release. The volunteers greet each guest, a medical assessment is done, they are fed, given a place to sleep, and are helped with travel plans and contacting their sponsor or next of kin. Within a day or two, they are on their way by bus to meet up with family or friends. One person took exception to my calling the guests ‘migrants’. Of course they don’t fit the traditional model of someone coming here as a seasonal, migrant worker, but they are migrants in the true sense of the word. Plus, they are asylum seekers and refugees from terrible conditions. The needs continue to exist. Think of what you would pack for a 3-day bus trip with small kids. Jars of baby food, small pants (men, women, boys, girls,), warm gloves and caps, chapstick and other lip balm, new underclothes, backpacks, toys/stuffed animals for the kids, and canned or dry food. Bring your donations to the Ward 6 office at 3202 East 1st Street. We will get it over to the monastery in a way that is not disruptive or alarming to the people working at the facility. 'Til we are called to rise. This coming Sunday, beginning shortly after 4 pm, Sacred Space sets up shop in the Ward 6 community room. They are here every week, in one form or another, for small groups, teachings, and music. The teaching this week will be on the Buddhist approach to compassion. Compassion is what is happening at the monastery. They are giving me the opportunity to share some music ahead of the teaching. I am putting together a set that walks through the journey I have experienced – and continue to – with the loss of my mom. We will also have some poetry titled Grief included mid-set. I cannot tell you how many people have shared that they too know this path. Come and be a part of it on Sunday, both the teaching and the reflections in music and word. To learn more about Sacred Space you can look over their website at www.sacredspacetucson.org. When I called my Uncle Chuck in Michigan last Friday, he told me it was sunny and in the 40’s. Yes, well, we had our own fun in the snow. It is nice, for a day. No surprise to anyone that weird weather is now the norm. Changing weather patterns are a part of the climate changes we can watch play out all year. There are online tools and apps you can use to track weather, even in 15-minute increments. A precipitation map has been put together to primarily help track flooding during monsoons, and it is up and running, and available for you to check anytime. interactive precipitation map (the Arizona Flood Warning System website). Rillito Park is a county owned facility at which the non-profit Rillito horsemen conduct a 12-day, live racing season each year. It is going on right now. A couple of weeks ago, I wrote about Turf Paradise, a for-profit track up in Maricopa County. My story was about the fact that the fatality rate at Turf Paradise is nearly triple the national average, and that the ownership has implemented none of the recommendations to up their game, as suggested by the Jockey Club, a group of horse advocates wanting to see the rate drop to zero. Since I wrote that, I have learned that Turf Paradise is requesting the Mayor and Council approve a license through which they would be allowed to send signals of their live races to a local bar in Tucson for Off Track Betting (OTB). In the trade, it’s called a Parlor. It is gambling on the horses. In addition to their own races, Turf Paradise would be sending signals of any horse race they are streaming – from say, the Breeder’s Cup or other race tracks across the country. In effect, it is a license to do OTB locally, 365 days a year. There is much more to this than just letting Turf set up a parlor. It affects the ability of the Rillito track to even survive. There are only a few tracks operating in the state. Turf is the largest and the wealthiest. They have successfully lobbied the state to set a rule that in order to run an OTB parlor you must conduct at least 140 live races per year at your facility. The Department of Racing has set a cap of 12 live dates that can be run at the Rillito. In fact, no other track qualifies for these licenses under the current rules than Turf Paradise. It is a monopoly on OTB in Arizona. Why does that matter? When somebody bets on a race, 80% of the money goes to the bettors in the form of winnings. Another 10% goes to the horsemen in the form of the purse (how much each horse wins depending on how they placed). The final 10% goes to the track for its ‘commission’. That piece is subject to city sales tax. The Rillito is required to put $200K annually into facility upgrades according to its lease arrangement with the county. Right now, since they cannot generate any OTB revenue, even by hosting streamed races at their own facility, they get zero for commissions. All of the money that does not go to bettors goes back to the equestrians. That means the Rillito non-profit relies on donations to meet their O&M obligations. If Turf Paradise is allowed to come into Rillito’s own backyard, gobble up multiple OTB licenses and starve the Rillito folks out of any opportunity, it is easy to predict the end of live racing in Tucson. To be clear, I am not a huge horseracing fan. That is why I wrote about the fatality rates at Turf Paradise. In contrast, the Rillito group is already working with the soon-to-be UA veterinary college in hosting an equine wellness program out at the track. Not only are they ahead of the curve when it comes to fatalities and horse injuries, but in the general welfare of the animals. That is the difference in mentality between a local non-profit and a large for-profit monopoly. Back to the license issue. We are being asked to approve a license to allow Turf to get its nose under the tent for local OTB. There is also activity up at the state legislature to overturn the 140-day rule. That would allow the Rillito to apply for a license and do OTB right out at their track. That would generate local revenues, which could go to their financial obligation to the county, expanding the equine wellness program, and more broadly, keep Tucson tax money in Tucson. I doubt most people are aware of the story behind the story you will read when the Mayor and Council vote on whether or not to allow the horse parlor in Tucson. What I have given here is really the tip of that iceberg. I do not gamble, but I do want to see our tax base kept here, and not flow up to Maricopa County. As long as the Rillito non-profit group is working on animal welfare through the UA veterinary school (to open next year) and leading by example, I see no advantage to anyone in Pima County to sit by and let Turf into our market. It is about an even playing field. Change the 140-day rule, let the Rillito track into the game, and let us see who wins coming down the stretch. Right now, only one racetrack has a slot at the post. To muddy the water a little more, there is a bill being floated around Phoenix right now that would eliminate the Department of Racing altogether. The bill would roll their responsibilities into the Department of Gaming,which adds even more clarity to what this industry is all about, and why Turf Paradise is trying to corner the market on OTB. We have had our hands-free ordinance in place as a primary offense since last year. It has had a demonstrable impact on TPD’s ability to pull people over and compel them to get their phones out of their hands. The state is still statutorily silent on the topic. We do not need them stepping in now, finally reacting to too many deaths and serious injuries on our roadways due to distracted driving and voiding out our own efforts. That is my gut, and principled position. Yet, the greater good is getting something in place on a statewide basis, and SB1165 does that. The reality is that without the recent death of the Salt River police officer who was struck and killed by a distracted driver during a traffic stop, this bill would not have been possible. It is sad that had to be the catalytic event, but 1165 passed through committee last week and is scheduled to be heard in Rules Committee today. It will likely go to the full senate for debate and a vote after that. If SB1165 is adopted our local ordinance stays in place until January 1st, 2021. The state is using the upcoming year as an ‘education period. It would be nice to see the ban adopted, though I am not giving full-throated support because of the unnecessary local pre-emption the bill contains. It has been a while since I have given an update of local efforts to bring film into the Tucson region. Shelli and her folks at the Visit Tucson film office continue working productively with the new State Film Office in attracting opportunities, and they are doing outreach on their own as well. The results are positive. We are just over half-way through the fiscal year. So far, the VT film folks have generated close to $5.6M in film-related direct spending. That is new money into the local economy that would not have been here, but for the films. Some of the work includes the on-going Border Life reality series, Border Live (a 24-day film shoot from along the U.S.-Mexico border), another Discovery Channel series called Shifting Gears, twelve more days generated by the documentary, Mavericks (the crew stayed at the AC Marriott downtown), a fashion magazine shoot from the U.K., and a bunch more. These all generate room nights at our hotels, and local spending in a variety of other segments of the economy (building sets, hiring crew, catering, transportation…). There is a bill making its way through the state legislature (HB2258) that will provide for permanent funding for the state film office. The Arizona Film & Media Coalition is supporting the bill, and it is bipartisan, so it has a chance. If you would like to see more film activity locally, and if you are signed onto Request to Speak, that would be one you might want to register a note of support for. Two short updates on water this week. One is the ongoing negotiation process related to preventing the Bureau of Reclamation from stepping in and dividing up our CAP water among the various users around the state. The Drought Contingency Plan (DCP) needs to be adopted before March 1st or we may be conceding that authority to the Bureau. In an effort to finalize the DCP, several pieces still need to be agreed upon. One that was approved last week is really a short-term water swap. It is not long-term conservation, but it may play a part in buying us some time and holding the feds at arm’s length. The Central Arizona Water Conservation District (CAWCD) is the 15 member governing board who runs the CAP. Their charge is to manage the Central Arizona Project. They are a key player in the negotiations related to keeping water levels on Lake Mead stable. The Salt River Project is an association of water users that is responsible for distributing water from the Salt River to the various groups who have a claim on it. Last week, those two groups agreed to share and swap water rights with the goal of keeping Mead above 1,075’ in depth. In the agreement, the SRP will deliver 10,000 acre-feet of water to customers they have in common with the CAWCD, from 2021 through 2025. In exchange, the CAWCD will keep 50,000 acre-feet of water in Lake Mead until 2027. They will then make the SRP whole for the 5 years of deliveries they are agreeing to. It is a mechanism to keep water on the Lake. As I said, it does nothing to advance the necessary long-term conservation of the resource, but it was agreed to, and is one of the few remaining DCP deal points left on the table. The other water item has to do with this person. He is Art Schaap, the owner of the Highland Dairy in Clovis, New Mexico. Making a living at dairy farming is tough enough. Add pollution from PFC’s, and it becomes an impossible task. You see, Art discovered that 7 of his 13 water wells have been contaminated with PFAS. It is one of the toxins we have found out by DM. Because of that, he has been dumping 15,000 gallons of milk each day, has had to lay off his 40 employees, plans to kill all 4,000 of his dairy cows, and has learned the PFAS levels in his own blood stream are 8 times what is considered to be normal levels. His farm got the PFAS from the nearby Cannon Air Force Base. Because of the pollution, Art cannot sell the milk, he cannot sell the beef, he cannot sell the cows, and the crops on his property are compromised. The Department of Defense has disclosed over 120 bases where groundwater has been tainted by PFAS. Our court date for joining the lawsuit against 3M and other PFC product manufacturers is coming up this week. I spoke to a counterpart back in New York last week. The extent of the contamination back there also continues to grow. Tucson Water officials are working closely with Davis-Monthan to gather data that will help us continue to effectively manage the problem in order to ensure we’re not serving water that is even close to the 70 parts per trillion levels the EPA is now calling a health hazard. We continue to get positive publicity as a tourism destination. Most recently, our cycling opportunities have received national attention. Setting aside the snow day we had last week, the reliability of our weather conditions is one of the strong selling points. So are the vistas and scenery bikers can enjoy here. Tucson was called “Winter Cycling Heaven” by Outside last week. They highlighted our weather, but also pointed to how easy it is for bikers to experience a variety of ‘ecozones’ in just short day trips. The same is true for film producers. Urban centers, trails, mountain riding within microclimates, and each with a network of unique cafes, breweries and restaurants. These are some of the many reasons El Tour de Tucson, and biking in general, makes Tucson an international destination for biking tourism. There is the success of our downtown revitalization. I hear from time to time that we have given too much focus to the downtown economic boom. In fact, it is successful downtowns that often kick start the economic expansion of metropolitan centers’ outskirts. It begins in the center. IDA is an on-line development guide that recently had this to say about the importance of downtown development, “A strong downtown is critical for a successful city and region. Downtowns and center cities are where people, capital, and ideas coalesce due to size, proximity and density.” It is why I have poured so much effort into seeing successes in downtown Tucson since 2009. We had the streetcar; we have put into place over 20 economic redevelopment incentives; our approach to working with contractors and developers in the downtown core has significantly evolved; our relationship with Rio Nuevo has changed from being one that got the City in front of the Auditor General, to one in which we’re now focused on projects that benefit the region; and all of this is attracting notice from groups such as IDA. In their report, “The Value of U.S. Downtowns and Center Cities”, they name Tucson as one of the rising stars. We were included along with several other cities in a study that validated the importance of starting where the density exists, and expanding outwards from there. While it is nice to be noticed from the outside, just take a trip through downtown and you will see the immense successes we have achieved. I mentioned the AC Marriott in the film section. We are close to breaking ground with another hotel adjacent to the Tucson Convention Center. The Flin development is in construction. The Cathedral construction is taking shape. It was the Downtown Tucson Partnership who partnered with IDA in the economic development report. They represent all of our downtown merchants and can attest to the positive impact all of this is having on our tax base. There is a lot to be proud of when it comes to fostering partnerships, relationships, and good development in the urban core. I have asked for a study session agenda item for March 19th in which we’ll continue the dialogue about good development, this time along the Sunshine Mile, the stretch of Broadway that extends from Euclid to Country Club. It is the RTA, voter approved expansion that I continue to believe was misguided. It never needed to be the 150’ wide, 8 lane thoroughfare the voters were sold, and I don’t believe the alignment needed to be as wide as what has been called the RTA’s compromise at 124’. Mayor and Council adopted it, so it’s what we have to work with. In the aftermath of that approval, the city has purchased properties along the corridor in order to accommodate the widening. Utility work will begin this summer. While those purchases were taking place, Rio Nuevo emerged as a partner. They now have Project for Public Spaces (PPS) on board, and together we have made presentations to the public in which destinations could be created, with several of the sites left intact after the expansion. There are three in particular, on the north side of Broadway, each with a unique set of characteristics, and facing its own unique set of challenges when it comes to variances for things like parking and access. The study session I have asked for is to initiate the public process of creating an overlay zone along the Sunshine Mile. An overlay is a rezoning where different solutions are crafted from one location in the zone to another. One site may need shared parking, and another may need parking in the back. Yet another may need cross-access opportunities. The overlay discussion will move forward through public outreach, to identify the varying needs so that when development happens, we’ll be able to preserve what we can at the existing locations where the alignment doesn’t force demolition. We need to get this conversation started since utility construction is about to begin. The Sunshine Mile is within the TIF, Rio Nuevo District, so they are eligible to step in and be a partner in all of this. The vision shown by PPS has been very consistent with what we heard from the public during the initial round of development discussions that occurred back before the alignment was approved by Mayor and Council. Now we have a chance to see some of that come to fruition. Assuming Mayor and Council agree to start the overlay process, look for those public outreach efforts to begin soon. You can do all the biking highlighted in the Outdoor report. You can stroll around downtown during 2nd Saturdays (coming March 9th). You can walk the Sunshine Mile and begin putting ideas together for the upcoming public overlay discussions. All of those miles can count towards our Moon Walk – if you register. You know I have a soft spot for moms. I will be honoring mine in song this week. Today I am recognizing this lady, she is Semba. Semba is the African elephant mom who’s living out at Reid Park zoo. She gave birth to Nandi about 4 years ago. Now, she is pregnant again. This will be her 4th kid. Her husband, Mabu is dad to all of them. Zoo staff is keeping a close watch on Semba’s weight. At last count, she is just under 7,000 pounds. I’d say that’s a ‘healthy’ weight. They are making sure she is getting adequate vitamin and mineral intake as a part of her diet, and the medical staff continues to keep track of her blood counts. It is all a part of helping her through to a successful delivery. Gestation for an elephant is about 2 years. I am nearly certain that my bride would not have enjoyed another 15 months being pregnant, even to carry our little girl. Semba is a trooper, though, and is about half-way through the term. She is still out and about for your viewing. You can visit her and the rest of the critters at the Zoo from 9am until 4pm, 7 days per week. Saturday March 2, 2019, 10:00 – 11:30 a.m.
Before photography, botanists, ecologists and naturalists gained local ecological knowledge of the Tucson Basin through observation, sensory exploration and “thinking out-loud in pictures” – drawing and painting. Ecologist and artist, Dr. Lee Ann Woolery, offers a 20-minute presentation on Art as a Way of Knowing the Ecology of Place and then provides a demonstration in the Garden. This presentation is free and no registration is required. Consider taking her full course on March 12 (see below). Art from students of Tohono O’odham Community College including a variety of media; photography, prints, drawings, pottery and baskets. The community college offers a 2-year degree in Fine Arts with the opportunity to transfer to any of the Arizona Universities or to Institute of American Indian Art in Santa Fe New Mexico. The range of subject matter and content addressed in their artwork covers a wide range of ideas. Students enrolled in Tohono O’odham Community College include the traditional iconography of the Tohono O’odham and their individual concerns and expressions. 3D art is on display in the glass cases February 1-28, 2019. LAST FRIDAYS returns for 2019! Shop under-the-stars with your favorite MSA Annex merchants while enjoying live music and on-site restaurants every last Friday of the month. A family and dog friendly event.